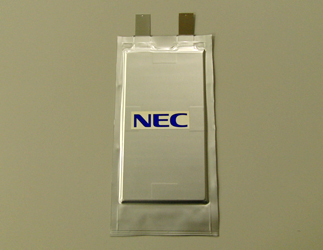 NEC Corporation have developed a next generation manganese lithium-ion battery prototype featuring cathodes that support high voltage operations and an electrolyte solution that improves the stability of high voltage operations. These developments are expected to help increase the range of electric vehicles in the future while reducing the weight of batteries. NEC currently develops and produces lithium-ion batteries with cathodes made with manganese, an inexpensive and abundant resource. These technologies are used in large capacity storage batteries for electric vehicles as well as residential use. However, improving a battery's capacity per weight (energy density) has been a challenging issue for further development. In order to solve this issue, NEC introduced higher voltage to batteries and made progress in the development of an electrolyte solution that suppresses the oxidative decomposition of the electrolyte solution that is generated on the surface of cathodes from the higher voltage. This new cathode and electrolyte solution improve battery energy density by approximately 30%, increase battery capacity and decrease battery weight, all while maintaining a high level of safety. "These developments can contribute to increasing the driving range of electric vehicles, enabling the production of light weight storage systems and simplifying the management of battery systems by decreasing the number of cells," said Hidenori Shimawaki, General Manager, Smart Energy Research Laboratories, NEC Corporation. "Furthermore, these new batteries provide high voltage drive and the same long operating life as conventional 4V lithium-ion batteries." The new batteries are able to perform high voltage operations as a result of using nickel in replacement of a material in existing spinel structured manganese-based cathodes, which have a high level of safety while recharging. The use of these cathodes and graphite anodes enables the average operating voltage to increase to a high voltage of 4.5V from the 3.8V of existing technologies. As a result, energy density increased by approximately 30% to 200Wh/kg from 150Wh/kg. This increases stored energy by approximately 30% when compared to existing batteries of the same weight. Alternatively, these new batteries are about 30% lighter when compared to existing batteries with the same energy storage. The solvent of the electrolyte solution was changed from a conventional carbonate-based solvent to a fluorinated solvent that is highly resistant to oxidation. This enables the suppression of oxidative decomposition where the electrolyte solution and the cathodes interface, which has posed a challenge for existing techniques. These batteries maintain approximately 80% of their original capacity after undergoing tests (*2) with 500 full charge and discharge cycles in conditions below room temperature (20°C), while maintaining roughly 60% when above room temperature (45°C). Furthermore, the batteries demonstrate life span performance equivalent to that of conventional 4V batteries. The practicality of these batteries are further demonstrated by the suppression of gas formation within cells and a significant reduction in the battery swelling ratio to just 10% (more than 100% swelling in conventional batteries) after cycle tests conducted at above room temperature. NEC will continue to drive research and development that supports greater capacity, life span and reliability for these batteries in preparation for their adoption by electric vehicles and large, stationary storage batteries alike. Nissan & NEC have been partners in a lithium-ion batteries joint-venture called Automotive Energy Supply Corporation (AESC) since 2007. AESC are currently the exclusive supplier of Nissan Leaf batteries. Is this the next generation long range Leaf battery they have been working on since 2009?